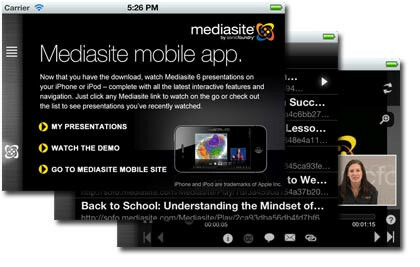 Mediasite is a hardware and software platform to record lectures (presentation with video, audio, PowerPoint, text, graphics, etc.) and websites (live or on-demand) or classic media (CD-ROM, DVD) to make available to a wide audience. This allows you to make your lectures and seminars accessible to your desired target audience in no time without much effort. 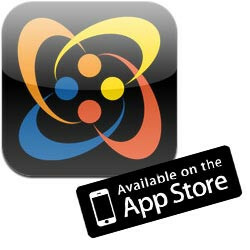 Mediasite is going mobile - leading the way with live streaming to iPads, iPhones, iPods and more. From course lectures and online training to executive communications and special events, Mediasite 6 empowers learners everywhere with live and on-demand rich media streamed to their favorite devices. But mobile support is just the beginning. Known for its rock-solid lecture capture and enterprise webcasting, Mediasite by Sonic Foundry continues to push the boundaries for recording, streaming, archiving, managing and tracking rich media knowledge and special events.